Have you ever heard a speaker deliver an entertaining and captivating address that you felt was incredibly relevant to you? Have you ever wanted to be able to have the same effect? If you're wondering how to practically incorporate that to a higher degree of effectiveness, this session is for you! Join the 2003 World Champion of Public Speaking in examining ways to select, cultivate, and utilize stories that add the maximum impact to your speech. When: Thursday, September 30, 2010. 6 pm sharp, Edmonton Shaw Conference Centre. Dinner, Speech Contest & Keynote. Listen or click for details. Toastcaster 33 - Achieving Greatness Together - It’s Toastmasters, Baby! 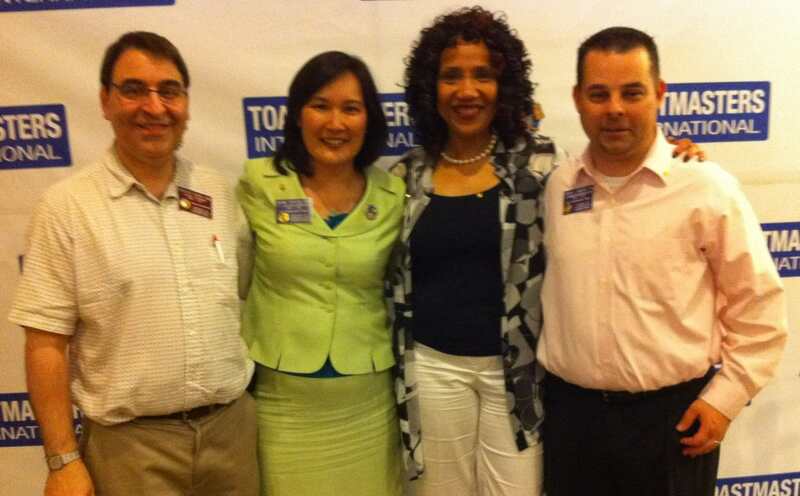 North Carolina's District 37 Trio LGM Naomi Takeuchi, DG Sharon Anita Hill and LGET Bryan Walsh (far right) share with yours truly their District Theme "It's Toastmasters Baby" to complement this year's International President's theme of "Achieving Greatness Together". Recorded in Palm Desert at the 79th annual Int'l Convention, you'll hear how this Select Distinguished District, 3 years running, will use this year's District theme and innovative initiatives that any District can use to engage their members to exceed their potential. You'll also hear how Toastcaster Greg first took notice of this terrific trio from the "First in Flight" State.